Chalkbeat: "New York City Must Move Faster to Combat School Segregation, Lawmakers Say"
In December, Chalkbeat published an article by Ritchie Torres, Brad Lander, and Daniel Dromm that spoke about diversity progress in New York City schools in last three years. The article mentions IntegrateNYC, and commends its part in the process! Restorative Justice Initiative: "There's More Than One Side to Every Story"
This video compiles interviews from 16 students and other practitioners involved in restorative justice to explain the concept and describe the ethos and mission of RJI. In this episode of Inclusivus, host Judith Registre interviews Matthew Diaz, Youth Director of National Outreach for the Committee on Resource Allocation for IntegrateNYC, and Executive Director Sarah Camiscoli. Sarah describes the roots of school segregation in New York City, and Matthew speaks about his initiatives as a student activist to change this system. 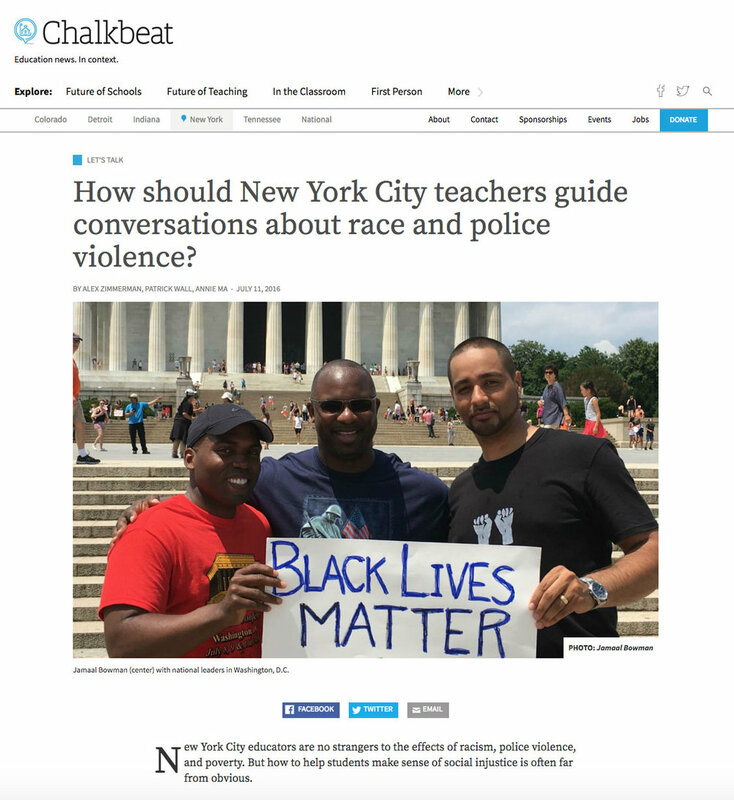 Chalkbeat: "Students Demand A Say in New York City's School Integration Plans"
Chalkbeat publicized IntegrateNYC's student rally that took place on the steps of City Hall in May. Students protested in order to demand school integration in New York City and a voice in the undertaking. The IntegrateNYC advocates from District 15 have called for the removal of the scanners in their school, which students walk through every day. The students point to the incredible harm this does to students' dignity, the vast statistics that show the disparity of scanner placements meaning they disproportionately harm poor students of color, and the damage surveillance does to a sense of community within a school building. After the advocates painted a mural and held an unveiling in their community, inviting political leaders and other activists, Mayor de Blasio announced "the city’s first formal protocols for adding and removing metal detectors from schools." The Huffington Post published an article about IntegrateNYC's origins and school exchange program. As part of the SchoolBook "What To Do About New York City Schools" series, WNYC sat down with Amera Attalah and Nashalie Robledo of District 7 and Hebh Jamal of District 2. Listen to these Student Advocates share their experiences and visions for an integrated city. Read the full article here. 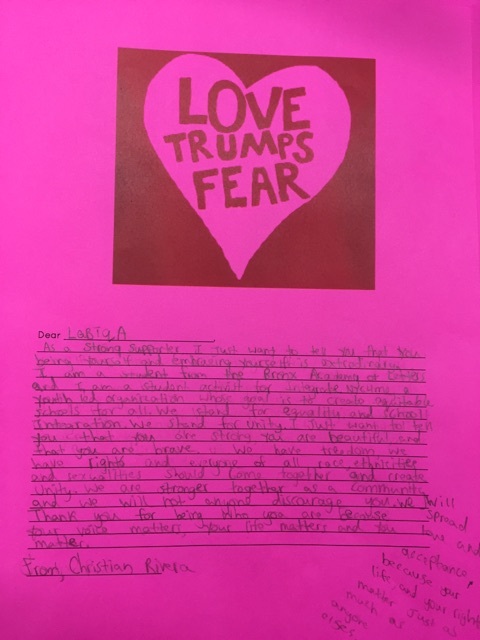 Sarah Camiscoli, Co-Founder and Co-Director of IntegrateNYC, was selected to participate in A FEARLESS FORCE: Public Speaking for Visionary Women Leaders offered by Fearless Communicator. The intensive program was offered to eight exceptional women leaders and culminated with a 10-minute TED-style signature speech. Watch the story of IntegrateNYC as told by Sarah above. School Stories: "Building a Student Movement One Paint Stroke at a Time"
Check out School Stories' coverage of our new mural painted by students from Park Slope Collegiate, in protest of scanners in schools. As WNYC did recently, PRI's The World released a feature on Bronx Academy of Letters' integration course earlier this week. Read the story to learn more about what students have gained from the course. 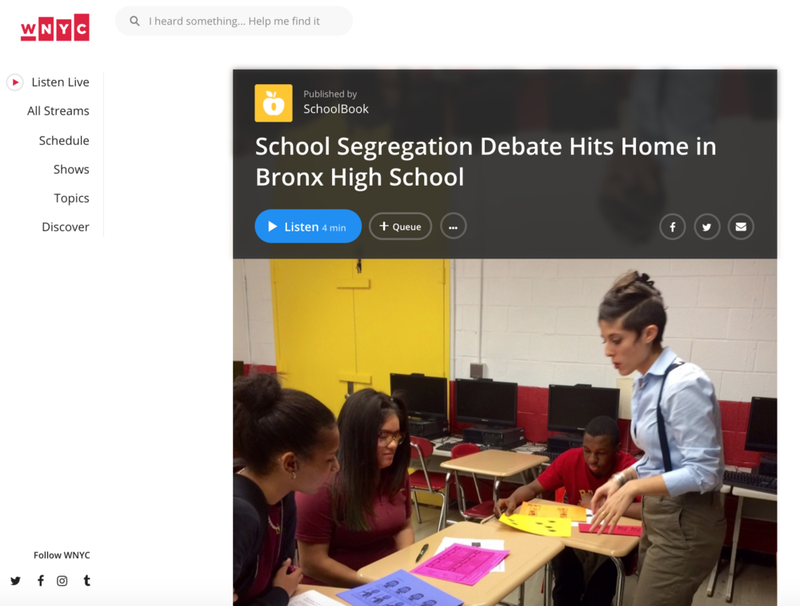 This morning, WNYC's SchoolBook ran a story on an elective course on integration taught at Bronx Academy of Letters by IntegrateNYC director, Sarah Camiscoli. Listen to hear student perspectives on what they've gained from the class, and what they'll be presenting to the Department of Education next year. This year, IntegrateNYC director Sarah Camiscoli is teaching an elective class on school segregation at Bronx Academy of Letters. In the class, students discuss school segregation as a national and local issue, study how resources are distributed among segregated and integrated schools, and develop skills in student advocacy. Ultimately, they will present their findings before the DOE. 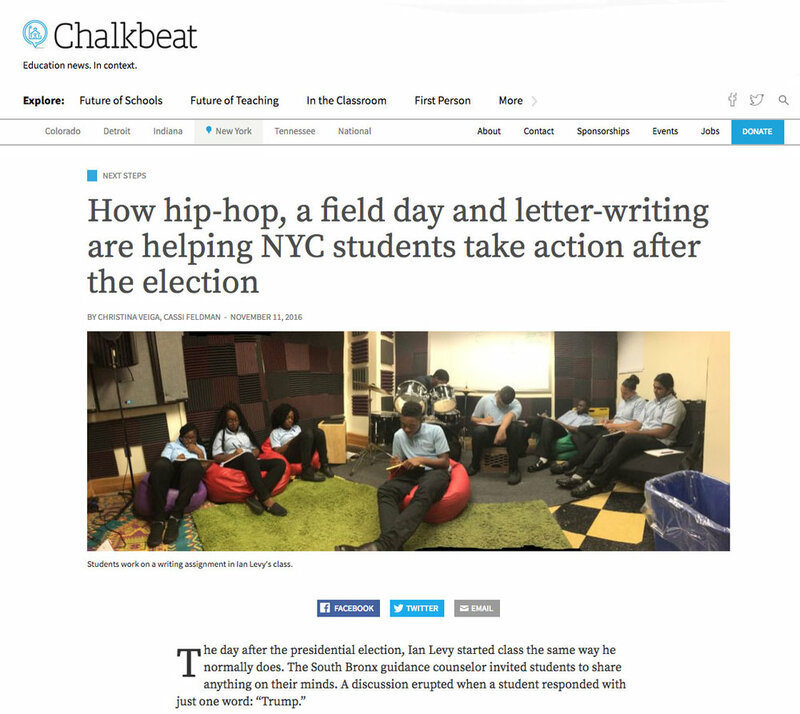 Read the full feature by Monica Disare on NY Chalkbeat. On May 27, City Council came together to pass the School Diversity Accountability Act, legislation that will require the DOE to report more thoroughly on school diversity and demographics. This is a massive win for IntegrateNYC: it was, in fact, our 2015 campaign goal! Last December, student interns from IntegrateNYC4me testified in support of the act.